Already in 1884 the first Schlaraffia chapter in North-America was founded in San Francisco. Today there are 27 chapters existing in the United States, Canada and Mexico. The newest chapter was just formed as in Victoria, BC, Canada during 2016. In addition a new chapter is in the formation stage in Boulder, CO, called a ‘Stammtisch’ (Round Table). There are around 520 active members registered in all of the North-America chapters. Traditionally each chapter carries a unique name, typically characterizing its location or origin. Furthermore, they are numbered corresponding to the sequence of formation. In the following table you can find all the present chapters in North-America, ordered by state and country. It also shows relevant data of the chapter and its coat of arms. 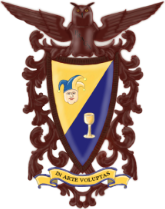 Many chapters have websites, and you can open them for further information by clicking on the coat of arms.